Anti-draft protesters launch first demonstration following death of Yerushalmi Faction leader. 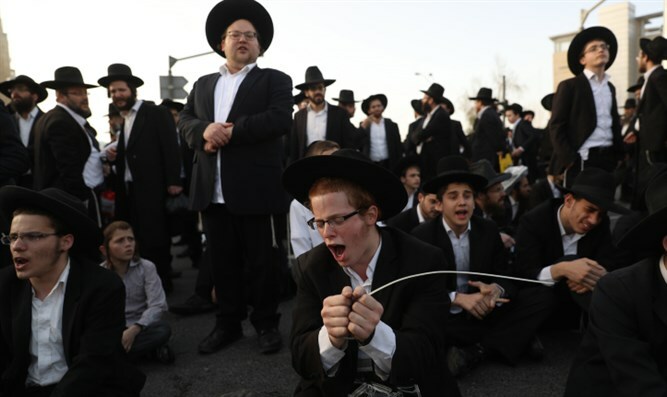 Hundreds of haredi protesters from the radical Yerushalmi Faction blocked roads in the capital Thursday, the first such demonstration since the passing of the faction’s founder, Rabbi Shmuel Auerbach, last month. Protesters blocked traffic near the entrance to Jerusalem, shutting down Yirmiyahu Street in front of Center One, near the city’s Central Bus Station. The faction’s rabbinical advisory council called for the demonstration in response to the arrest of a haredi draft-dodger. The Yerushalmi Faction, which has been criticized by mainstream haredi leaders including Rabbi Chaim Kanievsky, has orchestrated a series of protests and road-blocking demonstrations nationwide in recent years. Activists have demanded that the IDF exempt all haredi yeshiva students from the draft, and have encouraged supporters not to comply with draft officials – even for the securing of service deferments. At present, full-time yeshiva students are offered annual draft deferments, which may be renewed each year without limit. Jerusalem police have deployed Border Police officers, mounted police units, and anti-riot police officers from the Yassam special unit to remove demonstrators and reopen blocked roads to traffic. Authorities later reported that demonstrators had also blocked traffic at the entrance to Jerusalem under the String Bridge. “Eastbound Route 1 has been closed to traffic. There is heavy traffic from the Harel exchange to Jerusalem,” police reported.